The food Zapper or Food Zappicator, also known as a north pole speaker box is based on a circuit introduced by Dr. Hulda Clark, and is represented as being for killing parasites such as bacteria and protozoa in food without cooking using a North pole speaker orientation. It is well established that the Hulda Clark Zapper does kill bacteria, protozoa, fungi, and many other microbial organisms and potentially parasitic organisms. We spent a good amount of time studying 5 different models of speaker box food zappers and found that while the zapper does kill microbes, the food zappicators / speaker boxes accomplished little or nothing in respect to killing microbes. We obtained food zappers / Zappicators from several different sources. Upon arrival, we opened them up for inspection to verify that they had been built according to Dr. Hulda Clarks instructions. All were correctly built and some had internal zapper circuits while others used an external zapper to supply the signal. We used plastic ice cube trays and Ball jars to hold the test samples of pond water with numerous various microbes. Orginally, the trays or jars were placed on the activated speaker boxes for a period of 1 hour. At the end of one hour, the samples were microscopically examined and found to be basically unchange from the original samples. The existing microbes were all healthy and active with little evidence of any killed microbes. The population density was unchanged. Since the results were so bad, we decided to run the test again but this time the test was run for 24 hours. Again, the results were dismal and there was little or no evidence of the speaker boxes killing any of the microbes. While the Zapper appears to work superbly at killing microbes, the speaker box Food Zappicator fails miserably and should be considered a waste of money. If you are buying a zapper with a Food Zappicator, ask the seller to provide actual proof that their Zappicator actually works in the form of a video showing the destruction of microbes. Users will likely want to learn more about Is Hulda Clark A Quack?, and her protocols, how to find the Best Zapper, the ParaZapper UZI Review. 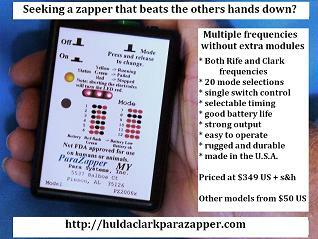 You can buy a Zapper from huldaclarkparazapper.